"It's deja vu all over again..." Facebook is re-enabling the controversial (okay, creepy) facial-recognition tagging feature that tries to identify people in photos found on the site. If you don’t want Facebook to help friends of your friends figure out who you are, you need to check your privacy settings. A game that lets you leash, slap, electrocute, or pepper-spray a virtual girlfriend wouldn’t be acceptable, right? But Boyfriend Trainer which lets you do all of that and more to men, was accepted by both the Apple and Google app stores. Apple yanked it after a few days, but it's still available for Android devices, and on the Web. 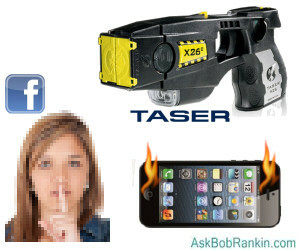 Instead of using a taser on your boyfriend, why not just print a new one? InMoov is a 3D-printable robot designed by French sculptor and model-maker Gael Langevin. He shares the digital printer files and assembly instructions on his blog. This just in, from the No Good Deed Goes Unpunished Department: Hamed Al-Khabaz was a computer science student at Dawson College in Montreal, when he discovered a serious flaw in the Student Portal software the school used. After reporting the bug, which could be used to gain unauthorized access to private student records, he was thanked by college officials. And then expelled. What if you could make your smartphone explode in the ear of the jerk who stole it? The Defense Advanced Research Projects Agency’s (DARPA) Vanishing Programmable Resources (VAPR) program is working on electronics that self-destruct upon remote command, to protect classified technology. So what’s 64 GB of SSD storage worth? $100 if it comes in a 128GB iPad. Apple began offering 128 GB versions of its flagship tablet starting February 5. Black or white, it’s $799 for WiFi-only or $929 for WiFi plus cellular connectivity. More clicks will be required after you install the next update of Firefox. Mozilla plans to enable a Click to Play security warning for all Java, Adobe Reader, and Microsoft Silverlight plug-ins in Firefox’s next update. The latest version of Adobe Flash plug-in will be unaffected. Blackberry maker RIM has changed its name to... Blackberry. How’s that for reinvention? Also, the company promises to teach customers how to use its new phone, the Blackberry Z10, because nobody wants just another phone that you can figure out yourself. Blackberry’s Super Bowl ad showed you all the things the forthcoming Z10 phone won’t do: Set you on fire (are they sure? ), give you elephant legs, teleport you, or turn your truck into rubber ducks. So of course you’re now itching to find out what the Z10 can do. Right? Well, nobody ever said that people who spend $3.8 million for a 30-second ad spot are smart. Over 20 million Comcast customers who received "free" digital adapters for their bedroom TVs in 2010 will start paying $2/month for them this year. Don't like it? You could switch, but Verizon and DirecTV already charge $6 per adapter. Most recent comments on "Geekly Update - 06 February 2013"
It's not just Comcast, Verizon, and DirectTV: Time-Warner in Rochester has started charging $2.95 per month cable modem rental (for a modem that costs $19.95 on Amazon). Though that modem was included in the charge for internet services before, Time-Warner is disingenuously claiming that this added charge is not a price increase. Right.